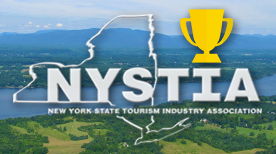 The Cayuga County Office of Tourism has been recognized as a leader in New York State’s tourism industry with the NYSTIA Tourism Excellence Award for Visitor Service in the public sector. NYSTIA Tourism Excellence Award winners are selected based on demonstrated commitment, leadership and accomplishment in travel and tourism. The Tourism Excellence Award for Visitor Service goes to the tourism promotion agency, community, or attraction that has worked strategically to welcome visitors more effectively. “The NYSTIA Tourism Excellence Awards celebrate and reward private and public-sector people and organizations that go above and beyond with their marketing campaigns and strategies, producing outstanding results that deserve to be recognized in a statewide forum and we are very proud to be included in this group of tourism leaders,” said Meg Vanek, executive director of the Cayuga County Office of Tourism. The award will be presented at the NYSTIA Annual Meeting Awards brunch on October 19 at the Great Escape Lodge in Lake George. Cayuga County Tourism’s online training program was designed to educate anyone that interacts with visitors about Cayuga County’s unique tourism assets as well as sales, customer service, and diversity training. To learn more about the program call the Cayuga County Office of Tourism at 315-255-1658.